We have assembled an incredible array of prizes for this Ultimate Steel™ Spectacular with over $200,000 in custom, limited edition and production knives, celebrity signed knives, guns and more. Every prize has been generously donated, so 100% of the proceeds supports Knife Rights’ pro-knife legislative initiatives. Knife Rights is the One Getting it Done™ – Rewriting Knife Law in America™ WITH YOUR HELP! At least the top 75 winners IN EACH DRAWING select their choice of available prizes! Every donation made prior to 5:00 PM PDT May 26, 2016 is also eligible for our EARLY BIRD BONUS DRAWING with over 100 production knives and other prizes totaling OVER $30,000! Every ticket entered during the Early Bird period is also part of the Main Drawing, including those tickets that are drawn as winners in the Early Bird. The Early Bird is a BONUS drawing and all Early Bird entries are also part of the Main Drawing. Get ‘Em Before They Are Gone! The blade and handle of this Fire Ant Red Izula has been laser engraved by KnifeWorks with a unique patriotic design by Jim Frost. The complicated design requires 30 minutes to laser engrave for each knife! Prototype Photo. Actual Donation Bonus Izula may differ slightly. Mock-up. Actual Donation Bonus Amicus may differ slightly. * While supplies last. Void where prohibited. Please allow up to 16 weeks for delivery of Donation Bonus Knives, 24 weeks for delivery of Hogue Donation Bonus Knives. Donate Here for a chance to Win! FREE Annual Membership with $60 or More Donation! Knife Rights, Inc. is a 501(c)(4) exempt organization. contribution because of its political and legislative advocacy. Prize winners must be U.S. residents at least 18 years of age. by May 26, 2016 for Early Bird premiums and prizes. Drawings will be held within 2 weeks of closing dates. NOTE: Additional prizes are still being pledged and recieved and will be posted as soon as confirmed. Click Here to Make a Donation and get Chances to WIN this or from over $200,000 in Prizes! Becker Knife & Tool BK-32 Clear Coat Campanion and BK-39 Clear Coat Combat Bowie donated by KA-BAR Knives autographed by Sheriff David Clarke with “ALL KNIVES MATTER!” PLUS another BK-32 and BK-39 to use! Two for SHOW, Two for GO! 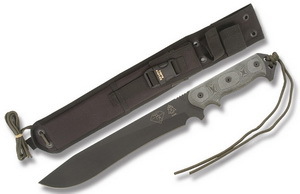 TOPS Tex Creek XL Fixed Blade donated by TOPS Knives autographed by Oliver North PLUS another TEX CREEK XL to use! One for SHOW, One for GO! TOTAL RETAIL VALUE: $400 – Autograph PRICELESS! SOG Kiku Large Fixed Blade and Kiku Large Folder donated by SOG Knives autographed by Dana Loesch PLUS another Kiku Large Fixed Blade and Folder to use! One for SHOW, One for GO! TOTAL RETAIL VALUE: $796 – Autograph PRICELESS! Becker Knife & Tool BK-32 Clear Coat Campanion and BK-39 Clear Coat Combat Bowie donated by KA-BAR Knives autographed by Wisconsin Governor Scott Walker with “ALL KNIVES MATTER!” PLUS another BK-32 and BK-39 to use! Two for SHOW, Two for GO! NOTE: Additional prizes are still being pledged and received and will be posted as we get them. ESEE Cutlery ESEE 6P Fixed Blade donated by ESEE Cutlery autographed by by NRA Executive Vice-President Wayne LaPierre PLUS another ESEE 6P to use! One for SHOW, One for GO! Awaiting Photo of Signed Knife. Click photo to view full details. Click Here to Make a Donation and and get Chances to WIN from over $200,000 in Prizes! Click photo for full details on this year’s donation. Click Here to Make a Donation and get Chances to WIN this or from over $100,000 in Prizes! Donation knife not yet completed. Knife not yet completed. Last year’s knife shown. One-of-a-Kind Benchmade Concept Knife donated by Benchmade Knife Co. Knife not yet completed or determined. Previous year’s knife shown. Knifemakers snapshot of similar knife. Click photo to view larger image and full details.s. Custom Queen Cutlery Damascus & Stag Moose Skinner donated by Queen Cutlery Co. Knife not yet completed. Click placeholder to view full details. GLOCK G40 Gen4 in MOS Configuration donated by GLOCK, Inc.
Click Here to Make a Donation and get Chances to WIN this or from over $150,000 in Prizes! Click snapshot to view larger image for full details. Click photo to view larger images and full details. NOTE: Some prizes include multiple items and includes all items listed at a “TOTAL” retail value. For items that are valued as “EACH,” multiple identical prizes are being offered. Benchmade Model 3300 Infidel OTF Double Action Automatic donated by Benchmade Knife Co.
Benchmade Model 62 Bali-Song donated by Benchmade Knife Co.
SET of 2 Schatt & Morgan #54 Coles Wharncliffe Whittlers 1 of 100: Stag and Elk Handles donated by Queen Cutlery Co.
Click photo to view both knives and full details. Benchmade Model 928 Proxy Flipper Framelock Folder donated by Benchmade Knife Co.
Hogue Knives Model EX-A01 4″ Automatic Button Lock/Button Release folder donated by Hogue, Inc.
Hogue Knives Model EX-A04 3.5″ Automatic Button Lock/Button Release folder donated by Hogue, Inc.
SET of 2 Schatt & Morgan #54 Coles Wharncliffe Whittlers 1 of 50: Amber Worm Groove Bone and Whisky Catilena Bone donated by Queen Cutlery Co.
Hogue Knives Model EX-F01 7″ Fixed Blade – Cocobolo donated by Hogue, Inc.
Hogue Knives Model EX-02 3.75″ Tanto Point Liner Lock folder donated by Hogue, Inc.
Hogue Knives Model EX-04 3.5″ Wharncliffe Button Lock folder donated by Hogue, Inc.
Hogue Knives Model EX-03 4″ Drop Point donated by Hogue, Inc.
Firearms and suppressors will not be shipped directly to winners, but rather to Federal Firearms Licensees (“FFLs”) specified by winners (or selected by KR or Hill Country Class 3 LLC d.b.a. Silencer Shop (Silencer Shop), in KR’s and Silencer Shop’s sole discretion). Winners can only take possession of firearms and suppressors from the FFLs. Optional suppressor included with some firearms prizes can be excluded if the winner is ineligible for any reason or prefers not to become subject to the requirements of the National Firearms Act (NFA). Current wait times for NFA transfers conducted by the BATFE are nine to twelve months and could be longer. KR is not responsible for tracking such wait times. Winner is responsible for compliance with the NFA and all state and local laws governing the possession of NFA items in the winner’s jurisdiction. Neither KR, nor KR Affiliates (as defined below), nor their successors or assigns, nor the supplier of the suppressor prize, are responsible for failure to complete delivery of such prize for any reason, including without limitation the prize winner’s failure to comply with any legal requirements. Declining to accept a supressor prize, or failure to satisfy the legal requirements for a firearms or suppressor prize selected, forfeits any claim to that firearm or suppressor prize and no replacement, alternative prize, or cash equivalent will be provided. Automatic knives will not be shipped directly to winners unless a legal recipient under 15 U.S.C. §§ 1241-1245 and 18 U.S.C. § 1716(g), but rather to an authorized dealer in eligible winner’s state from which winner can claim prize. Some prizes are subject to additional limitations that are included in prize description. Claim to prizes is not transferrable with the exception that delivery of a suppressor prize can be recieved by a trust of which the winner is a responsible person qualified to receive an NFA item. The odds of winning vary based on the number of donations and amounts donated. Winners will be drawn on or after August 1, 2016, for the Main Drawing. Early Bird winners will be drawn on or after May 26, 2016. If held, Tail End Drawing winners will be drawn on or after August 1, 2016, immediately prior to the Main Drawing. A minimum of the first 75 winners drawn in both the Early Bird and Main Drawings, and the first 5 winners in the Tail End Drawing, if held, will have first choice of prizes available after any prior winner(s) have selected, in the order in which such winners were drawn (“Winner’s Choice”). At KR’s option, additional Winner’s Choice prizes may be awarded. Accordingly, the final posting of winners may take up to 180 days post drawing. Winners must comply with all applicable legal requirements prior to taking possession of firearms, suppressors or knives. Winners are solely responsible for determination of legality. If for some reason winners cannot comply, prizes will be held for 30 days and then will be forfeited and returned to KR. Winners of firearms are responsible for shipping charges, transfer fees to FFLs and any other applicable fees and may be required to prepay such expenses by valid credit card or other method to be determined in KR’s sole discretion. NFA prizes (silencers/suppressors) will be transferred via the “Powered By Silencer Shop” dealer network. Winner will not incur any additional charges unless exceptions are made. Exceptions include but are not limited to: changing SOT dealers after paperwork is filed, changing registration type, facilitating a dealer outside of the “Powered By Silencer Shop” dealer network. In most cases, Silencer Shop will handle the transfer from start to user receipt and will require contact with the winner to insure registration information is valid and complete. If communication cannot be facilitated between Silencer Shop and the winner, NFA Prizes will be held for 30 days before return transfer to the manufacturer is initiated. All prizes other than firearms will be shipped at KR’s expense via a shipping method of KR’s choice, signature required at KR’s option, to the addresses provided by winners, insured. If delivery is not completed on original shipment, regardless of fault, winner is responsible for any redelivery charges. Winners are hereby warned not to sign for delivery without the package in hand and undamaged. Winners who do not respond to a delivery notice, regardless of reason, are responsible for any redelivery charges. Winners of prizes after the Winner’s Choice prizes are selected will be sent their prizes without prior notification to the address provided. It is donor’s responsibility to notify KR of any change in address. KR is not responsible for lost, damaged, stolen or undelivered prizes, regardless of cause, and winners agree to look solely to insurance with regard to same. KR is not responsible for reimbursement of any insurance deductible, which may be in an amount of up to $500. Risk of loss or damage is solely with winners. Winners of “Early Bird” prizes are eligible for (and their winning ticket will be automatically entered in) the Main Drawing. If held, winners of “Tail End” prizes are eligible for (and their winning ticket will be automatically entered in) the Main Drawing. Once an individual winner has been selected as a prize winner in the Main Drawing, that winning ticket is removed from subsequent drawings. There is no cash substitution for any prizes. Winners Choice winners will be notified using the contact information supplied and informed how to claim prizes. Only those named as the entrant on a valid winning entry form are eligible to claim a prize, and such persons may be required to provide proof of identification acceptable to KR in KR’s sole discretion. KR shall not be liable for failure of notification arising from incorrect or illegible contact information supplied, or email or voice mail induced failures, or failure of entrants to respond to communications (or failure of KR to actually receive such responses regardless of cause) within 48 hours of KR’s first attempt to notify the winners. KR’s obligation is limited to making good faith efforts to notify winners. 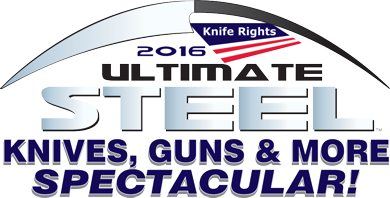 Once all winners are drawn and notified, names of winners (given name initial and surname) will be posted at the Knife Rights Ultimate Steel web site: www.KnifeRights.org/UltimateSteel. Your participation in this fundraiser (including without limitation the act of submitting a donation and/or winning a prize) signifies and is conditioned upon your acknowledgement, agreement, covenant, representation and warranty to KR, based on good and valuable consideration, receipt of which you acknowledge, that (i) KR, its officers, directors, affiliates, professionals, personnel, representatives and members, together with Silencer Shop and its officers, directors, affiliates, professionals, personnel and representatives (collectively, “KR Affiliates”) shall have no liability whatsoever in connection with this fundraiser, the prizes (or their acceptance, possession, use, or misuse), or anything arising out of or relating thereto; (ii) you waive and release any and all claims you may now or ever have against KR Affiliates; and (iii) you will not make any claims against KR affiliates and shall be estopped from so doing. KR makes no claim regarding the actual value of any prize and is not responsible for the accuracy of any value estimate provided by prize donors or anyone else. Manufacturer’s Suggested Retail Price listed for production items which may be purchasable for a lower price. KR does not guarantee the accuracy of the prize descriptions published. Prizes are in as-is condition. KR makes no warranty as to merchantability, fitness for a particular purpose, suitability or condition of the prizes. Prizes donated by individuals may have been previously used. Prizes incorporating Mammoth ivory, tooth or tusk (and/or other materials that may become prohibited or regulated) are prohibited from being claimed by residents of some states, including but not limited to New York, New Jersey and California. Prizes subject to change without notice. Production prizes may be substituted with prizes of equal or greater value prior to prize selection. Some prizes were not received by KR prior to the start of the fundraiser and KR is not responsible for the failure of any prize donor to fulfill the obligation to deliver the prize by the drawing date. If a winner chooses to accept a prize for future delivery, KR shall be deemed to have fulfilled its prize delivery obligation to that winner and KR shall not have further responsibility for prize delivery thereafter. A donation is not required to be entered in the drawing. To enter without making a financial donation, send a postcard with your name, phone number, email and address to: Knife Rights 2016 Ultimate Steel, PO Box 657, Gilbert, AZ 85299. Your postcard must be received no later than July 31, 2016 to be considered a valid entry. Only one postcard per person is allowed. KR is not responsible for undelivered or illegible postcards.